The Raytheon Company and Lockheed Martin Javelin Joint Venture recently fired a Javelin missile from a remote weapon station integrated onto a wheeled vehicle at Redstone Arsenal in Huntsville, Alabama. The test demonstrated Javelin’s vehicle-launch capability to an international customer that has expressed interest in purchasing vehicles integrated with Javelin. The Javelin missile launched successfully and hit a T-62 tank target from a range of 1,000 meters. Immediately after missile launch, the remote weapon station engaged an alternate target with its ballistic weapon, demonstrating a seamless Javelin integration that supports the warfighter’s requirement to quickly transition between multiple weapon systems. The Javelin is a man-portable anti-tank guided missile and employable fire-and-forget medium-range missile system. 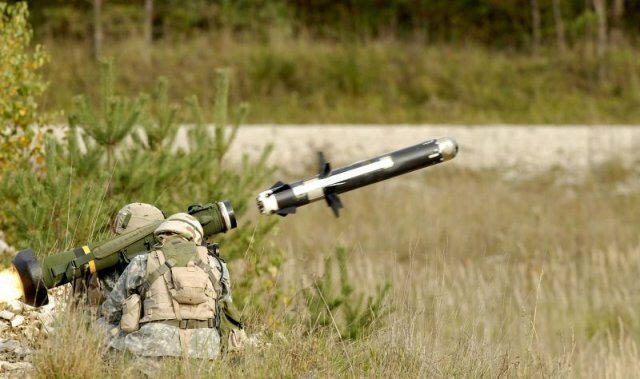 Designed to take the fight to the enemy, the compact, lightweight Javelin is ideally suited for one-soldier operation in all environments. The Javelin has secondary capabilities against helicopters and ground-fighting positions. Its direct-attack capability will engage targets with overhead cover or in bunker. Its "soft-launch" allows employment from within building and enclosed fighting positions. The soft launch signature limits the gunner's exposure to the enemy, thus increasing survivability.